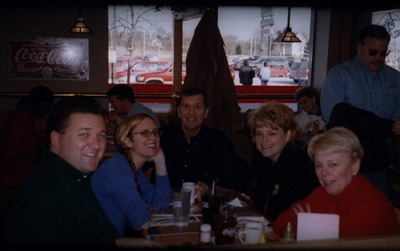 My family in A George Webb diner. December 26, 1999. It's a rainy night in New York City as I update my site for the first time this year, and I'm listening to Stravinsky's "Symphony in Three Movements." I'm going through a major Stravinsky phrase these days, and a major John Dos Passos phase - I'm rereading the USA Trilogy - and a major learning-Danish phase, and a phase of basically doing except writing stories and drawing cartoons. This is what comes of taking a break. In early September, after several months of fevered writing, I decided to take a little time off. I was exhausted - creatively, emotionally, and spiritually exhausted - and I thought it might do me some good. I hadn't taken any extended breaks since I started writing seriously, on Christmas Day 1986, when I was broke and stranded in Berlin and started making up people to keep myself company. That eventually resulted in my first novel, Kissing the Spires, now justifiably obscure. The time off has been good for me. In the past four months, I've found a new job, at Bitflip Interactive Group, moved this site to a new ISP, digitized and captioned 18 years worth of travel photographs, and checked off a long list of New York City landmarks I had always wanted to visit. The question, of course, when you've been away for so long, is how to start up again. Five George Washingtons has never been popular with readers, so should I continue it or abandon it in the middle? Levi Asher says its tone is sour, and that I do better with sweet than with sour. But if I abandon it, what else should I do? Bruce Johnson says everyone says behind my back that my cartoons are much better than my writing and I should forget about my stories entirely. John Molloy, with whom I spent New Year's Eve, says I should just retitle Five George Washingtons, so as not to turn off people uninterested in history. That makes a lot of sense, although it really never occurred to me before. Another question I'm wrestling with is stylistic. If I'm never again going to deal with the conventional publishing industry - and believe me, I'm not - why write something in conventional book style? Dos Passos' USA Trilogy is a great inspiration: it contains bits of newsreels, song lyrics, headlines, historical titles, and an interlinking cast of characters. I like that idea of folding many things into one, and I think it would be great for a website. Readers, what are your suggestions? Read old news: December 1999, November 1999, October 1999, September 1999, Summer 1999, May 1999, April 1999, March 1999, February 1999, December 1998, November 1998, October 1998, September 1998, August 1998, July 1998, June 1998, May 1998, April 1998, March 1998, February 1998, January 1998, December 1997, November 1997, October 1997, September 1997, August 1997, July 1997, June 1997, May 1997, April 1997, March 1997, February 1997, January 1997, December 1996, November 1996, October 1996, September 1996, August 1996, July 1996, June 1996, May 1996, April 1996, March 1996.